Movies showing today at the Odeon Liverpool ONE. Movie listings last updated on Friday 26th April 2019 at 2:00 pm. The Odeon cinema enjoys a great location at the Liverpool ONE development. With 18 screens it offers a huge choice of films to suit all ages and tastes. It opened in 2008, replacing the Odeon on London Road in Liverpool city centre. Screen 12 boasts an IMAX screen measuring 18 metres wide and 10 metres high. Screen 3 offers D-Box seats that move with the motion in the film. The cinema is open every day of the week. The cheapest tickets are for films shown Monday to Thursday before 5 pm. Reduced prices are available at all times for students with a valid student card, children, and teenagers (aged 13 -17). On weekend mornings, and during school holidays, Odeon Kids offers special showings for children. Tickets for both children and accompanying adults cost pocket money prices. Like most cinemas, the Odeon Liverpool ONE offers its own kiosks offering drinks, snacks and confectionery. Several screens at this cinema also feature The Gallery, a licenced area with larger seats and private bar serving alcohol and complimentary soft drinks, tea and coffee, popcorn, and nachos. The Gallery is available to customers aged 18 and over. Drinks and food are also available at the many bars and restaurants at Liverpool ONE. Nearby options include Nando’s, Las Iguanas, Pizza Hut, and Wagamama. The Odeon is located on the Leisure Terrace of Liverpool ONE. To reach Liverpool ONE and the Odeon from the M62, or any other major road, follow the brown tourist signs for Albert Dock (Liverpool One is next to it). There are three car parks at Liverpool ONE: Liverpool ONE (under Chavasse Park, postcode L1 8LT), John Lewis (postcode L1 8DH), and Hanover Street (postcode L1 4AF). The Liverpool ONE Bus Station offers frequent services from destinations throughout Liverpool and Merseyside. 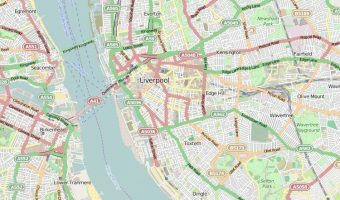 Train stations within easy walking distance are Liverpool Central (Merseyrail), Liverpool James Street (Merseyrail), and Liverpool Lime Street. Map showing location of Odeon Liverpool ONE. Shopping and leisure development in Liverpool city centre.